AMMAN — Parliament speakers of Jordan, Greece and Cyprus on Monday stressed on the outcomes of the trilateral summit of His Majesty King Abdullah, Cypriot President Nicos Anastasiades and Greek Prime Minister Alexis Tsipras a day earlier, which called for expanding cooperation between the three countries in various fields. 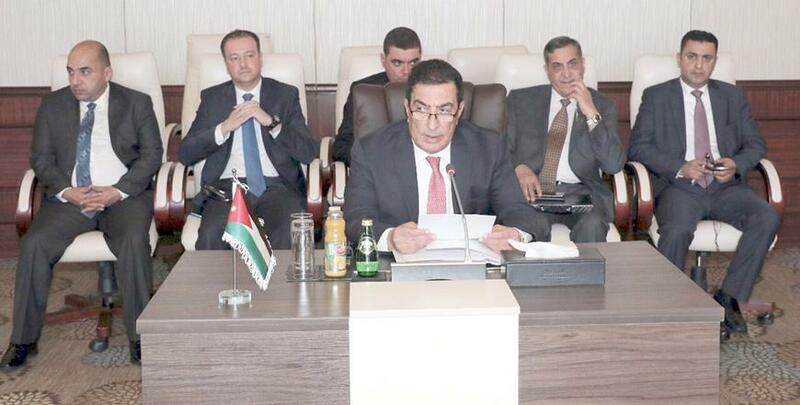 During their meeting at the Dead Sea, Lower House Speaker Atef Tarawneh and his Greek and Cypriot counterparts Nikos Voutsis and Demetris Syllouris highlighted the importance of supporting the efforts of King Abdullah, the custodian over Islamic and Christian holy sites in Jerusalem, in protecting the Holy City’s sanctuaries and maintaining its legal status quo, the Jordan News Agency, Petra, reported. They also called for supporting a comprehensive, just solution to the Palestinian-Israeli conflict based on the two-state solution. A statement issued following the parliamentary summit referred to the significance of parliamentary cooperation as a basis for joint values and principles to enhance government cooperation among the three countries. The parliament heads said that discussions addressed means to enhance cooperation in the energy, tourism, educational and cultural fields, on which they agreed to sustain talks on issues of mutual interest until reaching tangible outcomes through joint procedures and initiatives. The declaration called for supporting efforts aimed at resuming negotiations related to the Cyprus issue until reaching a permanent solution that all involved parties accept, adopting political solutions to the issue based on international legitimacy resolutions and respecting the sovereignty, independence and security of other countries. The parliamentary meeting also went over means to boost cultural cooperation, combat the illicit trade of antiquities and encourage the exchange of information. The speakers agreed to hold a second meeting in Athens and a third in Nicosia, according to Petra. Sunday’s trilateral summit aimed at expanding cooperation between the three countries in vital sectors, including energy, water, agriculture, tourism, healthcare, education, trade, investment and ICT. Several trilateral and bilateral agreements were signed during the summit to that end.